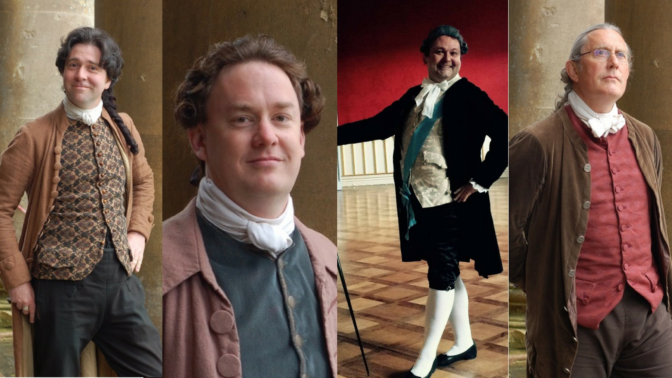 We are DELIGHTED to welcome back Stuart, Richard, Chris and Matthew for a third ‘Dances of Poldark’ weekend! This weekend is for dancers of all abilities to learn and enjoy some of the elegant and lively 18th Century dances featured in the BBC’s adaptation of Winston Graham’s ‘Poldark’ novels. Led by dancing-master Stuart Marsden, choreographer of the BBC Poldark series. Previous courses have sold out fast, so book your place asap to avoid disappointment. Dancing and music in 18th Century England was at the centre of society and therefore essential to the plot of its novelists. Halsway Manor offers a weekend away to explore the dances and music of this ‘Georgeous’ period written about and captured on camera in BBC’s adaptation of the novels of Winston Graham’s ‘Poldark’. We promise not recreate the 18th Century ‘baroque stage & court dances’ but do promise to bring the exquisite 18th century country dance steps, rhythms and sounds into our ballroom for all to enjoy – in the lovely setting of Halsway Manor! This course is for all levels of experience and will be tailored to the abilities of each dancer. Costume of the period is welcome – and encouraged – but not necessary. Stuart Marsden has worked as choreographer and dancing master for many historical TV dramas, documentaries & theatre productions including Poldark, ‘Pride & Prejudice Having a Ball’ (BBC2) and ‘The Georgians- Behind Closed Doors’ (BBC4). He is a respected researcher, caller and teacher of historical dance. The house band – known as ‘The Warleggan Band’ – appeared in Series One and Two of ‘Poldark’. Matthew Coatsworth (violin) also plays in Boldwood. Chris Green (guitar) plays in The Playford Liberation Front and GreenMatthews. Richard Heacock (violin) recorded the dance music for ‘Poldark’, and is a regular tutor (with Paul Hutchinson and Karen Wimhurst) on the successful ‘Playing Playford’ courses at Halsway. Pictured at the top (in fabulous Poldark-esque attire! ): Chris Green, Matt Coatsworth, Stuart Marsden, Richard Heacock.